The EU-sponsored network ERA-NET PathoGenoMics seeks new leads for future treatment and diagnostics of infectious diseases by supporting research on disease-causing microorganisms in Europe, accentuating analysis of critical factors on a genetic level. In line with this goal, the network awards prizes for outstanding PhD theses in pathogenomics. The winners of the fourth ERA-NET PathoGenoMics PhD award, Michal Feldman, (Israel), Matej Butala (Slovenia) and Eric Alix (France) were chosen by a review board of internationally renowned experts in the field of microbial research. 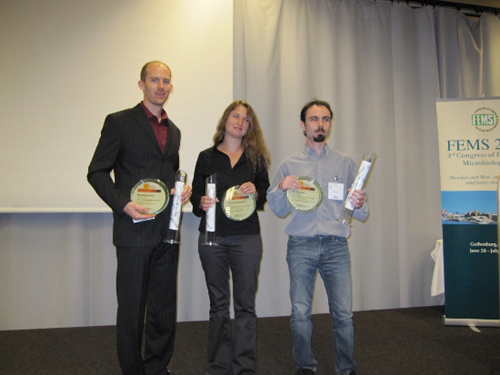 Picture 1: PathoGenoMics PhD Award 2009 Award Presentation. 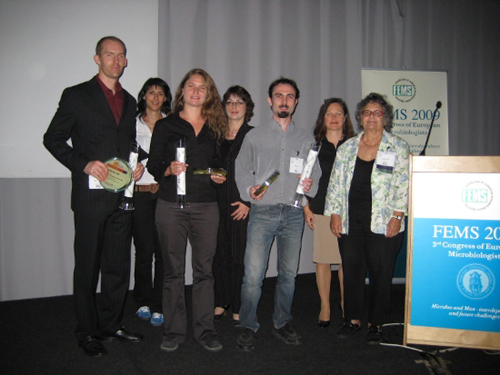 he prize of 2000 € was awarded on the 1st July 2009 during the 3rd FEMS Congress of European Microbiologists in Gothenburg, Sweden by Dr. Marion Karrasch-Bott, coordinator of the ERA-NET PathoGenoMics Network and Prof. Eliora Ron, former President of FEMS. Eric Alix, made his PhD thesis in the group of Prof. Anne Blanc-Potard at Universite Montpellier in France and studied the regulation, function and polymorphism of MgtC, a virulence factor conserved in several intracellular bacterial pathogens. In the laboratory of Prof. Roy at Yale University School of Medicine, New Haven, USA, Eric Alix in now working on the Legionella Type Four Secretion System effector RalF determining the subcellular localisation. Michal Feldman, carried out her thesis in the group of Prof. Gil Segal at Tel-Aviv University, Israel, working on the molecular analysis of the genetic variation existing within the icm/dot locus of different Legionella species. Michal Feldman is currently working as a Post Doc at the The Global Health Institute of the Ecole Polytechnique Federale de Lausanne, Switzerland, with Prof. van der Goo on the characterization of ER folding and assembly mechanisms of membrane proteins. Matej Butala, worked in his PhD thesis about molecular mechanisms of temperature dependant colicin K gene expression at the University of Ljubljana in Slovenia in the group of Prof. Darja Zgur-Bertok. After a stay as research fellow in the School of Biosciences, University of Birmingham under the direction of Prof. Busby, Matej Butala is now working as assistant teacher for molecular biology at the University of Ljubljana, Slovenia.